Dogs are list in alphabetical order. 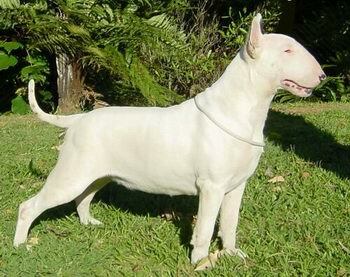 Only show results under Bull Terrier specialist judges have been included. Ch Bordeaux of Boromir 8.10.03. Co-bred with Rachel McKenzie (Clanrae). Ch Boromir a Lick of Frost at Vortex 14.10.09. Co-bred with Linda Flegg and Melanie Dalton (Pinewood). Frost died tragically at 13 months old after surgery to remove a bone lodged in his throat. A very sad loss for me personally, and also to our breeding program. Whoever said that cannon bones were safe didn't take into account the Bull Terrier jaw. This photo taken at 4 months old. Faith was owned by Paul & Kathy Berman of Amatol kennels in Australia. at 6 months owned by Paul & Jackie Boyd. Ch Boromir Black Widow 6.10.93. Aust Ch Boromir Holy Roller 7.3.00. Rico was campaigned in Australia by Diane Cuthbert and Kerry King before returning to New Zealand and retirement with Brent Nicolas. Brent has recently started his own kennel named 'Hollyroller'. Boromir Kiss The Sky 18.1.99. 'Mr Man' was another of our Brie babies. Ch Boromir Miss Venomous 15.8.92. Owned by Jan & Ralph Wiles. 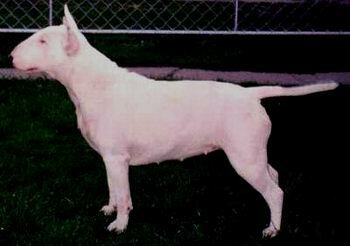 Khan was owned by Melanie Dalton of Pinewood kennels. RIP Mr Ning. Ch Boromir Pinball Wizard 10.11.05. Ch Boromir Practical Magic 29.4.04.
at 4 months owned by Gail Ritchie. owned with Greg & Corinne Powell of Samara Kennels. Sadly Khan was hit by a car at 6 months of age. Int Ch Boromir Red Kevlar de Bulls and Co 25.5.04. Tag lived in France with Leo at Bulls and Co Co-bred with Racheal Coldicutt of Baldomero Kennels. RISS Ch Boromir Shadow Sorcerer 29.4.04. Shadow is owned by Jane Maxwell. co-bred with Mandy Irwin and owned by Mandy of Manawatoa Kennels. Owned by Boromir Kennels. Brooke had one litter to Bolio King Cotton. Two of those pups - Boromir the Extremist and Ch Boromir Black Widow can be found in many of our pedigrees. Satch was the beloved pet of Ted and Pauline Bosswell. Flashwas owned by Jeanne Dusseau (Hawaii). 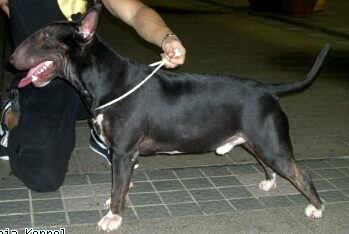 2005 ~ #19 Coloured Bull Terrier in the United States Canine Chronical All Breed Standings. Ch Boromir War of the Roses 15.8.92. 'Tarsha' was owned by Lisa and Darcy Rika. She was a wonderful blend of her parents' personalities and virtues. We purchased 'Scout' from her breeder Marilyn Tolley when Scout was 10 months old. She had two litters in New Zealand and one in Australia. She spent the rest of her days at Vortex Kennels. Jerry is bred by Mark and Michelle Dowell of South Australia. She was a fantastic showgirl, unfortunately we could not get her in pup so she retired to the armchair at Lesley and Buck's place.